Developed as a vegan alternative to the Luxury Nutroast, this is just as tasty and several of our non-vegan market customers tell us it's their favourite. Will you be at the Ironbridge Farmers Market on 15th December? If so, can I order 3 of the large luxury vegan and gluten free nut roasts to collect from you? They're so good I'm going to break with tradition and have one for Christmas dinner instead of making my own! The best nut roast I have ever had - light and full of flavour. Absolutely delicious! 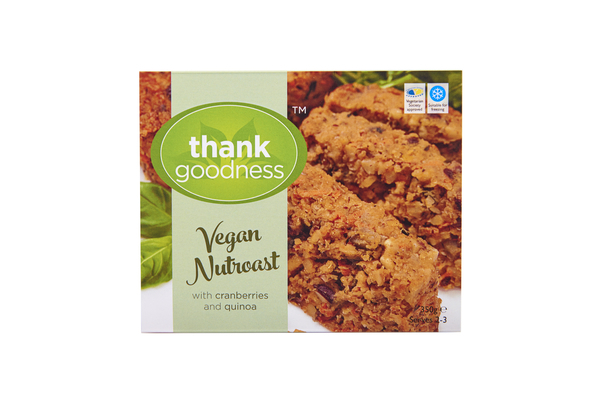 We had this yummy nut roast ... and it was enjoyed by everybody. The taste and texture are superb. The best all round prepared nut roast - ever - and we have tried some really delicious ones. Any leftover - if there is any - is delicious cold or in a sandwich. Thank goodness for Thank Goodness Ltd! Thank you for your review. We will get it live on the site as soon as possible.